With a “significant percentage” in 12-step recovery themselves, “they have formed a group called “Like-Minded Docs,which has more than 150 physicians, many of whom are medical directors of top treatment programs and also members of the American Society of Addiction Medicine (ASAM).” Dr. Thompson is in fact the Medical Director of Caron treatment center in Pennsylvania. The group also includes the medical directors of Hazelden, Talbott, Marworth, Promises, and other assessment and treatment centers used by state regulatory agencies to evaluate and treat referred physicians. The President of the American Society of Addiction Medicine is a Like-Minded Doc as is former White House Drug Czar (1973-1977) Robert Dupont. In addition, the physician who introduced the long-term alcohol biomarkers Ethyl-glucuronide (EtG), Ethyl-sulfate (EtS), and Phosphatidylethanol (PEth) is a like-Minded Doc as is Wayne Gavryck, The Medical Review Officer for the Massachusetts Physician Health Program PHS, Inc. How does he reconcile his 12-step belief system with fraud and misconduct? It is either doublethink or the A.A. spirituality persona is just a front. Although I applaud the ideal of addressing the psychosocial and spiritual aspects of addiction and acknowledge that 12-step recovery is a treatment tool that can provide great benefit to some people, I do believe there is an inherent conflict-of-interest here. Having no strong feelings for or against A.A, I view it through the same pluralistic and open-minded lens as I do religion or philosophy; there are many paths to salvation and none superior. I have referred patients to A.A. myself and see it as an option and a personal choice, one tool in the toolbox that can provide great benefit to some people, do absolutely nothing for others and, in fact, harm some. If it works for you good for you. Knock yourself out. If not then let’s try something different. So although the ideals of Like-Minded Docs are ostensibly laudable, the framework is not necessarily so. What is most concerning is a confluence of currents that preclude option and choice. It is a scaffold that can be used for coercion, control, and imposition. And this is exactly what is being done in many of the State Physician Health Programs (PHPs). Originally funded by state medical societies and staffed by volunteer physicians, PHP’s were designed to help sick doctors and protect the public. But over the past decade these programs have undergone a sweeping transformation due to the influence of the American Society of Addiction Medicine (ASAM). Unlike Addiction Psychiatry, ASAM is not recognized by the American Board of Medical Specialties (ABMS). They created their own “board certification” (ABAM) in 1986 and most physicians do not know that the only requirement is an M.D. in ANY specialty and some sort of experience in substance abuse. Trumpeting the false dichotomy that addiction is a “brain disease” and not a “moral failing” while portraying themselves as altruistic advocates of the afflicted, the ASAM has cultivated an organization that exudes authority, knowledge, respectability, and advocacy. They have set forth definitions of addiction, shaped diagnostic criteria, dictated assessment protocols, and shaped public policy all under the guise of scholarship and compassion. They introduced junk science such as the EtG and PEth alcohol biomarkers through Greg Skipper, FSPHP, ASAM, and another Like-Minded Doc. They created the “moral panic” of a hidden cadre of drug addled and besotted doctors protected by a “culture of silence” disguised as some of the best workers in the hospital and in fact look “just like us.” They introduced and promulgated the nebulous “disruptive physician” and successfully fostered a moral crusade to attack this huge hidden threat. And if you do a little searching you will find that their next target is the “aging physician,” demented doctors causing unseen mayhem and assailing the public good. They are now fomenting a call to arms to root out senility in medicine. It is the same tactic they used in the substance abusing and disruptive physician. Social entrepreneurs. Moral panic. Moral crusade. With no evidence base and the use of propaganda and disinformation they have convinced regulatory and administrative medicine that witches are real, witches are evil, and they are the authority when it comes to witches and know how to identify and root them out with our witchpricking instruments. And you know what?. It worked. And by infiltrating state PHPs they have become the might and main of addiction medicine in the United States. By removing dissenters who disagreed with the groupthink they have taken over most of the state PHPs and organized under the Federation of State Physician Health Programs (FSPHP). And the State PHPs under the FSPHP are very strict when it comes to choice in rehabilitation facilities for for physicians in need of assessments for substance abuse. In fact there is usually no choice in the matter. The physician may be given a choice of facilities but that is a ruse as it is a false choice– smoke and mirrors sleight of hand. Deception. As home to some of the countries top ranked hospitals and most prestigious medical schools Massachusetts is an international healthcare hub with world-class teaching, research, and clinical care. Two of the top three psychiatric hospitals in the United States as rated by U.S. News and World Report are found here in Massachusetts with McLean Hospital earning the top prize and Massachusetts General Hospital ranked number three. However, this medical mecca of learning and research is apparently unable to attract anyone with the competence and skill to assess a physician for addiction or substance abuse. In Massachusetts if the State PHP, PHS,inc. feels a physician is in need of an assessment the evaluation must be done at “a facility experienced in the assessment and treatment of health care professionals.” No exceptions. And apparently these esoteric skills are only found in Georgia, Arkansas, Alabama, Kansas, and a half dozen other far-away places. With over 20 years experience with the Massachusetts PHP, Physicians Health Services, inc., Harvard Medical Schools Dr.’s John Knight and J. Wesley Boyd published an article in the Journal of Addiction Medicine last year concerning Ethical and Managerial Considerations Regarding State Physician Health Programs. 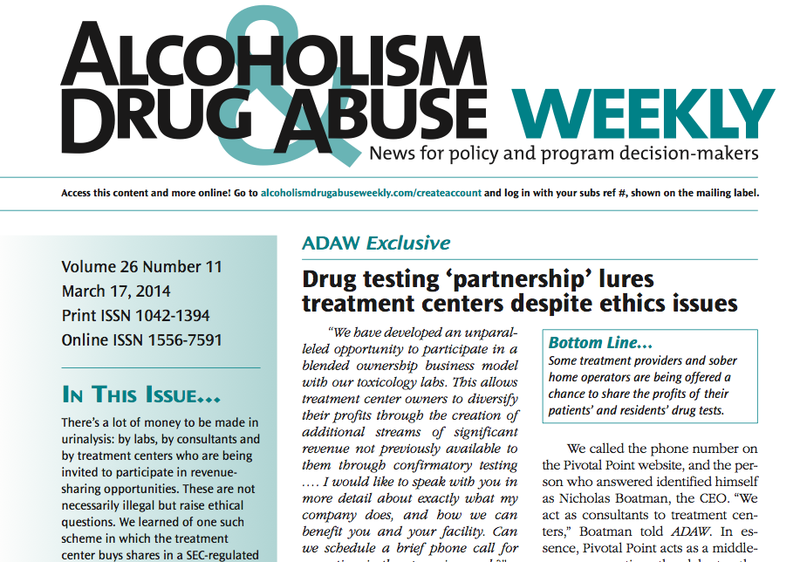 One of the issues they discussed was the conflicts of interest between the state PHPs and the evaluation centers. One comment I was surprised got past editorial review was that the treatment centers may “consciously or otherwise” tailor diagnosis and recommendations to the PHP’s impression of that physician. “consciously” tailoring a diagnosis is fraud. It is political abuse of psychiatry. It is unethical. It is, in fact, a crime. If you cross-reference the medical directors of the “PHP-preferred facilities” with the list of LMD’s it is a perfect match. Therefore when the PHP refers a physician for an evaluation and gives them a choice of an assessment facility there is no choice. It is three card monte. A shell game. Heads I win tails you lose. The ASAM has imposed the prohibitionist chronic brain disease spiritual recovery model of addiction on the field of medicine. It is a system of coercion, control, and indoctrination. And another ASAM Like-Minded Doc, Robert Dupont, is calling this the “new paradigm” of addiction medicine and wants to spread it out to other venues including schools. 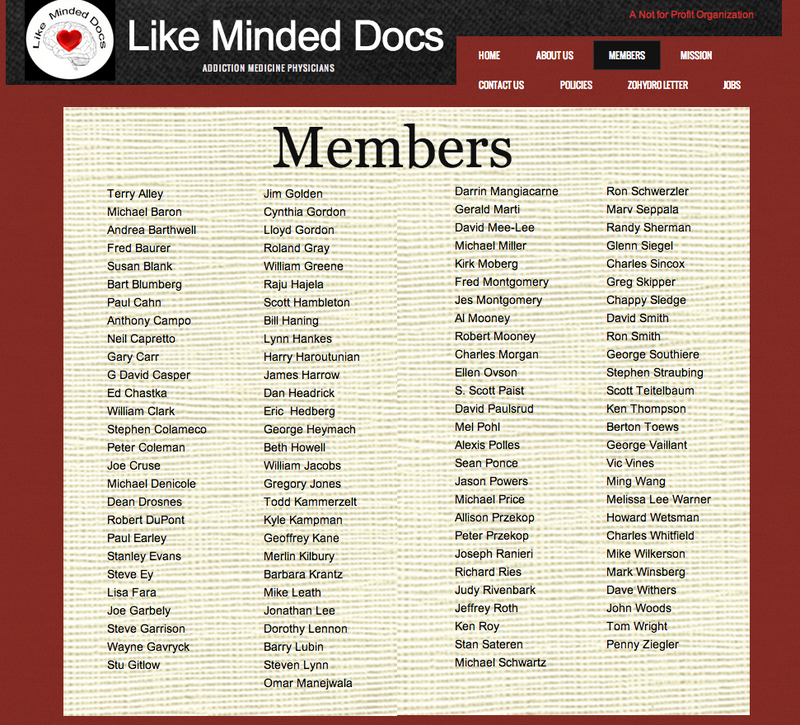 Like-Minded Docs solves the final piece of the puzzle. It explains why so many doctors across the country are claiming fabrication and manipulation of personality and cognitive tests to support nonexistent diagnoses. In evaluating a physician this group is not gathering data to form a hypothesis but making data fit a hypothesis that arrived well before the physician did. And this may be part of the explanation for the recent marked increase in physician suicide. With guilt assumed from the start, no due process, no appeal, and no way out physicians are being bullied, demoralized, and dehumanized to the point of hopelessness. This needs to end now. Medicine is predicated on competence, good-faith, and integrity. Medical ethics necessitates beneficence, respect, and autonomy. The scaffold erected here is designed for coercion and control. Exposure, transparency, and accountability are urgent. An evidence based Cochrane type assessment of their “research” and an Institute of Medicine Conflict of Interest review are long overdue. The emperor has no clothes and sunshine is the best disinfectant. 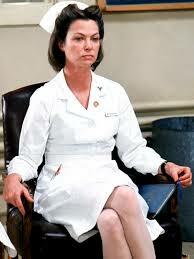 Interesting that you choose a malevolent nurse character to illustrate your piece about LMD. When you go to their website it states you need to be an MD or DO to become a member. Perhaps you should leave nurses out of this and choose an unsavory physician character. Not clear what you are trying to say here or what it even has to do with any of this? Perhaps you should clarify. Comment is very off topic. Are you talking a about the quote? It’s a quote from Ken Kelsey’s “One Flew Over the Cuckoo’s Nest” which is used because it concerns a” rigged game” and not meant literally. It has nothing to do with nurses per se.